Republican candidate for Oregon Governor Knute Buehler speaks about his plans for health care at press conference in Bend on Wednesday, July 18, 2018. A spot from State Solutions calls Gov. Kate Brown’s record on education into question. 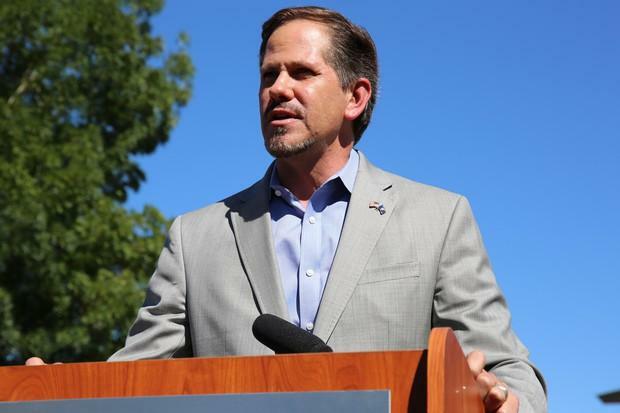 The Republican Governors Association is bullish on Knute Buehler. In a state where a Republican hasn’t sat in the governor’s office since early 1987, the national political action committee is showing signs it might be willing to put down big money to help Buehler beat Democratic Gov. Kate Brown in November. Beginning Aug. 24, State Solutions Inc., an RGA affiliate, spent more than $300,000 on ad time throughout the state. Its opening salvo: A spot calling Brown’s record on education into question. 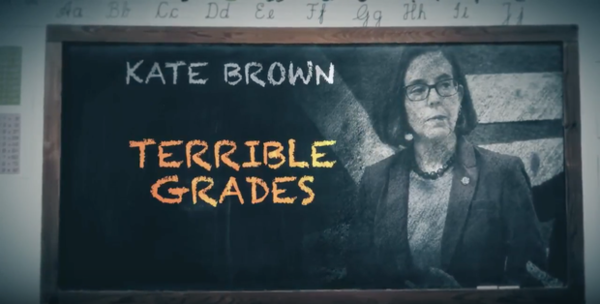 “Under Kate Brown, Oregon schools are getting terrible grades,” the ad intones, making mention of the state’s poor high school graduation rate, and a recent finding that fourth-graders are performing worse in math. Television stations in Eugene and Portland told OPB that State Solutions purchased ad space from Aug. 24 to Sept. 6 — buys ranging from almost $16,500 to $102,000. The RGA had already taken notice of Buehler’s campaign. It sent out press releases spinning any piece of news it thought looked unfavorable to Brown. But until now, the group hadn’t put serious money into helping Buehler’s chances, as it has for Republicans around the country this year. Steven Yaffe, an RGA spokesman, suggested the group was motivated by two recent polls indicating Buehler and Brown might be essentially even. Critics have derided the pollsters behind those results, though there’s a sense locally the race has tightened. The firms, Gravis Marketing and Clout Research, receive tepid marks in a rating of pollsters by the website FiveThirtyEight. State Solutions is structured as a 501(c)4 “social welfare” organization and is allowed to engage in political activities without revealing the sources of its funding — a facet that's led similar outfits to be labeled "dark money" organizations. That’s the same structure employed by local organization Priority Oregon, which has spent much of the year crafting attack ads against Brown. One recent ad featured a mother reading a “scary” bedtime story about Brown’s leadership to her children. In response, Brown’s campaign said the spot included an illegal falsehood. It demanded that TV stations cease airing it. Priority Oregon also appears to have had some involvement with the RGA this year. A disclosure to the IRS filed by the Republican group in July suggested the two organizations had shared $30,000 worth of “research,” although an amended copy of the disclosure filed the next day scrubbed any mention of Priority Oregon. Brown and her campaign have railed against the opaque funding. Asked about the RGA’s recent ads, Brown campaign spokesman, Christian Gaston, offered a similar take. Brown’s campaign has taken a different tack this year when it comes to negative ads. Earlier this year, a political action committee called Defend Oregon’s Values was set up by Service Employees Union Local 49. It funded ads attacking Buehler’s stance on issues like reproductive rights. As a PAC, the group must reveal its donors. As of the latest disclosures, Brown’s campaign had supplied more than half of the nearly $600,000 raised by Defend Oregon’s Values.